Former United States President George H.W. Bush returns to Washington, D.C., Monday for the last time. Americans plan to honor the 41st U.S. president with a state funeral on Wednesday. Bush died last Friday at the age of 94. He served one term as president, from 1989 to 1993, after a long career in government service. President Donald Trump has sent a presidential airplane to Texas to fly Bush’s body to Washington. The former president will lie in state inside the U.S. Capitol building from late Monday to Wednesday morning. Americans will then mark a national day of mourning for Bush, as the state funeral is held. President Trump has ordered the federal government closed on Wednesday. And flags on public buildings are flying at half-staff for 30 days in honor of Bush. Trump and his wife Melania are to attend the funeral at the Washington National Cathedral, as will other former presidents and their wives. After the service, the body will be returned to Houston to lie in repose at St. Martin’s Episcopal Church. On Thursday, it will be buried on the grounds of Bush's presidential library at Texas A&M University. Bush will be buried next to his wife Barbara Bush, who died in April, and Robin Bush, a daughter who died in 1953. In the United States, a state funeral is an honor set aside for those who have been elected president or other people chosen by the president. The last state funeral was held in 2007 to honor Gerald Ford, the 38th president. The first national day of mourning was believed to be held in 1791 with the death of Benjamin Franklin, a founding father. In 1799, the nation officially had its first state funeral with the death of George Washington, the first president. His funeral was held with full military honors at Mount Vernon, his home, in the state of Virginia. News of his death, however, was slow to spread across the country due to limited communication and travel at the time. With improved technology, news spread more quickly when the United States held the state funeral for President Abraham Lincoln on April 19, 1865. Lincoln was the first president to lie in state in the U.S. Capitol Rotunda. Other leading Americans have also been honored with the tradition, including Senator John McCain earlier in the year. Military honors usually accompany state funerals for presidents, as they also served as commander-in-chief of the armed forces. 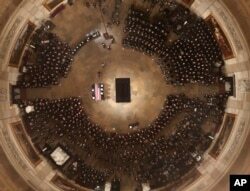 When Bush lies in state at the Capitol, his remains will be surrounded by a guard of honor representing the Army, Marines, Navy, Air Force and Coast Guard. Hai Do wrote this story for VOA Learning English. George Grow was the editor.